Well, since it's been almost a year since I've worked with polymer clay, easing back into it has been sort of painful. I started making some simple things. Thankfully, when I quit working with clay, I stopped abruptly so I have things in many stages of completion. There is nothing worse than doing one repetative action for hours on end like sanding or wire wrapping. I made my first color palette last night. 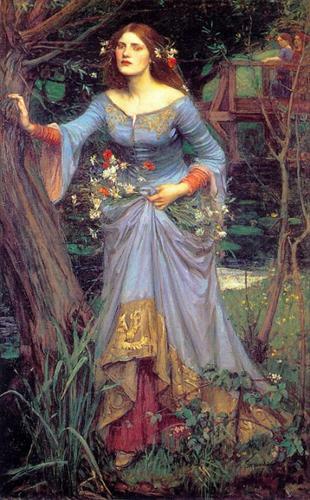 I based it on a lovely John Waterhouse painting called "Ophelia." He always picks such lovely, rich colors. This is the painting I used.